Readers often ask for ‘capsule collections’ of types of clothes – shoes, suits, ties etc. There are many reasons such a list is useful. It can point to the ‘essentials’: those things that provide the foundation of a wardrobe. It can suggest investment pieces. Or, if you commute by bike, it can make up a small, versatile wardrobe at work that can be recycled in different ways. I keep most, sometimes all, of the ties pictured above at my office. I find them the most versatile, most useful, most practical. Even, perhaps, the most pleasurable. Because nothing pleases me more than dressing simply but well. A plain navy tie is extremely versatile, going with almost all colours and patterns of shirts and jackets. Grenadine is the most versatile tie material in terms of formality, going with all but the smartest suits and all but the most casual knitwear. I wear this untipped model from Drake’s so often it’s embarrassing. Grey is not quite as versatile as navy. While navy ties go with navy suits, grey ties often aren’t the best choice with grey suits. Still, grey is very useful, and a square-ended knitted wool tie will go with casual jackets and dress up some quality knitwear. I tend to wear this one from Hermes with my Anderson & Sheppard shawl-collar sweaters. I argued a while ago that this is the most useful tie in a man’s wardrobe. If we stay with relatively formal suits and jackets, that might still be right. The nice thing about a club stripe is that it is big enough to go with any pattern of shirt, from a micro-stripe to a butcher’s stripe. As a general rule of thumb, patterns in ties, shirts and suits work when they are not too close in size to each other. A club-stripe tie always avoids that problem. 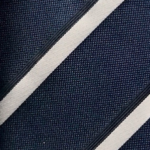 This particular one from Drake’s is given a subtle bit of a punch by a black edging to the top of the silver stripes. And while I don’t have a club, it is the colours of my college, which is nice. The pattern is so useful, I would include two in the capsule collection. Well, a block stripe rather than a club stripe, but the benefits are similar. A nice simple pattern that goes with everything. Having a brown-toned stripe helps the tie to go with slightly more casual outfits, specifically those with brown accessories. This, from Isaia, is perhaps the most interesting tie of the lot. It’s not an obvious choice: a green background, with small black motifs filled with lilac. Fairly unusual colours; yet it is extremely useful. The reason is how muted those colours are. Classic Hermes ties have always been popular for that reason – they’re nearly always in muted, simple colours that go with anything. Most brands don’t design ties like that. Subtle ties don’t jump off the shelf, don’t sell themselves from across the room. But they’re always the most useful, and it allows you to get away with colours like green, black and lilac. 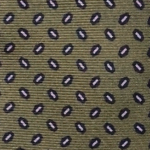 If you want a useful printed-silk tie, pick a muted colour with a small, geometrical pattern. Ties pictured on my vintage Louis Vuitton Alzer case, with hand-painted initials. You can follow the discussion on If you only had five ties – a capsule collection by entering your email address in the box below. You will then receive an email every time a new comment is added. These will also contain a link to a page where you can stop the alerts, and remove all of your related data from the site. I always thought that as white , blue and pink where 3 foundation colours for shirts therefore blue, green and red were the accompanying tie colours. No, and I almost never wear red. Dark red with a mid-grey suit can be nice (see shots of my Edward Sexton suit) but otherwise mostly no. Simon, would you discuss further your aversion to red ties please? I have an aversion to bright red (so many politicians look so bad with a dark suit and a white shirt, with a bright-red tie). But I have nothing against a burgundy, it’s a lovely colour. I’d have one in my top 10, as I say. It’s just never as versatile as navy, and often as green. Good point. So one should eliminate the bright solid red, or any shade approaching it, from the wardrobe, correct? Absolutely. You’re not on TV. You don’t need to stand out. 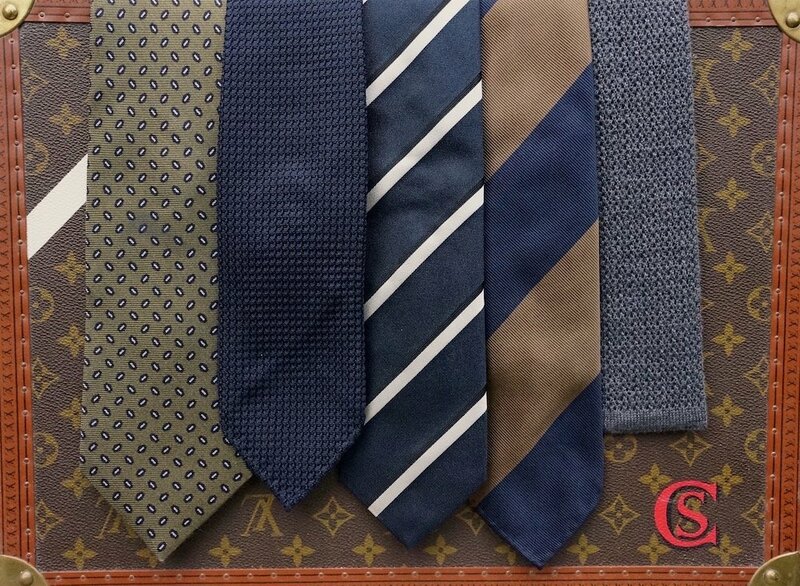 Do you have the same aversion to other bright solid ties such as blue,green, and orange for example? A bright red tie appears to be somewhat unique in its ability to make its wearer stand out, and not in a good way. Am I wrong in this observation? If so, should one avoid bright solid ties regardless of color? Red is particularly bad, but bright colours are always harder to wear than muted ones. Good advice, thanks. I’m very fond of orange as well. Is there a second worst bright color tie offender that you would eliminate from the wardrobe? Agreed. This has been a very enlightening discussion, thank you. Surprised the beautiful rust colored tie you wear in most of your pics is absent from this list. Interesting. I suppose ties are one of the few items in classical menswear where there is very little right or wrong and it all comes down to the individual. I should qualify that and say it is applied to those au fait with the rules and not sartorial neonates so i agree that there is a definite right and wrong. I mean your collection lacks a brown tie – which is a sine qua non for most that do not have UK sensibilities. And for suit wearers a (dark) red – like burgundy/ maroon/ wine is near-essential. I agree with the spirit of this article. Yes, I think the restriction here is that these ties must be useful for knitwear, casual jackets and suits. There is only room for one or two smart silks in that scenario, and I find my olive green goes better than red or brown with both grey and navy suits. Both colours would certainly make it into a top 10 however – and ties don’t take up that much space! How wide is the green muted tie Simon? Not many. Drake’s does a few, though often in a longer length as well. Shibumi does some nice ones, and has two choices of width, 8 and 9. Very good point! Bottle-shaped ties almost never tie a rich, full knot. What is missing for me is the pale blue / almost silvery grey small pattern tie done so well by Hermes / Ferragamo that sits so well with white shirt / any shade of blue suit. Drop the blue striped club tie in its favour. Can you provide a link to purchase? Specifically the navy/bronze and the navy club? 1. Navy grenadine. What are your thoughts of pairing it with a navy suit? I always worry that wearing a navy suit, light blue shirt, and a navy grenadine (while texturally nice) is too monochromatic. Thoughts? 2. When you mentioned burgundy/dark red not being as versatile as navy — wouldn’t a burgundy avoid monochromatism in most suit pairings? I doubt most of your readers wear a burgundy suit…. 3. Brown/chocolate grenadine. You mentioned in your comments that ideally it should be dark…how would it work with the brown shoes issue? I ask above because I have a nice navy suit and am looking for tie combinations. I think a navy grenadine would go nice with it but worry it’s too monochrome. I also think a brown grenadine would also go nice with the navy suit but worry about it being “too matchy” with the brown shoes. Would the brown and brown work if both are dark? 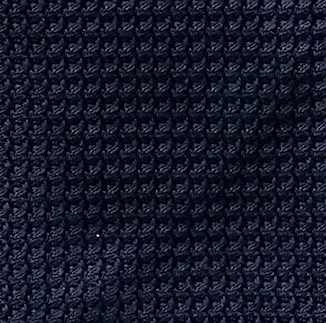 The navy suit is a typical wool suit and would be more “formal” than “casual”. Simon, this is an excellent article and thank you for writing it. You wrote “nothing pleases me more than dressing simply but well.” That statement is the most astute of the entire article and the essence of proper dress. If your readers would adopt that philosophy they’d all be better off as a result. Thanks Sandeep. The point of the ‘capsule’ or small collection is that it is artificially limited – for example by space at an office. I can only keep about three jackets/suits at the office, four pairs of shoes and around five ties. More would of course be nicer, in all three areas. Greetings Simon – can you clarify what this 5 tie philosophy has to do with “commuting by bike?” I’ve read your into a few times and I’m baffled. I commute to work by bike, in cycling clothes. When I arrive at the office, I change into smarter clothes that are kept at the office. I can only keep so many clothes at the office – so only a small number of suits, shots, ties etc. Really interesting choice of ties Simon, thanks also for the insightful explanations. Personally I would add in a brown silk – it goes well with blue, grey and light brown suits/jackets. I think culture and geography also have influence; to an Italian sensibility red (and pink) are seen as florid and gauche whereas in the US red is the first choice for politicians and businessmen (Obama, Trump as illustration – part of a red/white/blue palette). Would also like to know more about Grenadines and what makes them so versatile. Hi Simon–Who makes quality ascots? On another subject, have you seen Lobb’s latest boot? It is terrific and I bought one as soon as I saw their email to me. The British are –Good Show!!! Thanks for yet another interesting post! 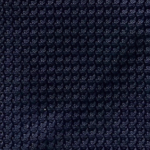 I´ve been looking for a high-quality navy gabardine-tie for a while. And I´ve understood that Drake´s (as always!) would be a good alternative. I get a little bit disturbed about that every navy grenadine I can find at their website is for a “large knot” though, since I prefer a smaller knot. What brand/model would you suggest for me? Or maybe, the knot in reality is not that big? By ‘large knot’ they are referring to the type of grenadine, not the knot it will tie. Try Turnbull and Asser. Lovely grenadines, not too thick, not a huge knot. I know a few people who keep their shoes at the office…but that is only so they can hide their real number of shoes hidden from the wife.. I would recommend Budd grenadines as a very good, and much cheaper alternative, to Drakes. another great article/ post! Can you expand on what you might pair with #4? I also have this tie, unsure of what trousers to wear with it. wool? colors? Always very useful as suggestions! Thanks! thank you for the response– looking forward to purchasing ‘finest menswear’ when released by Amazon, and hope you’ll do more ‘capsule collections’ or a piece on quality slimmer cut trousers and makers to put with the ol Navy Blazer standard. Nice selection. 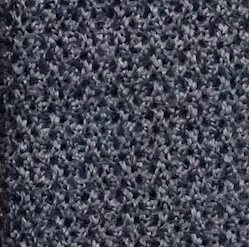 I have a grey cashmere knit tie with a heathered charcoal look that I enjoy. I am not a fan of wool knits and cashmere seems to offer just a bit more of a muted sheen. I have your latest books “permanent style” and “finest menswear in the world” both of which are excellent,but have terrible trouble getting hold of “le snob guide to tailoring” I did get one from amazon but its a German copy!any ideas where I might get a copy please,many thanks martin. Hi Simon, I just came across your site – surely the single best online resource of all that is exemplary in modern menswear – and it has utterly consumed my weekend. I live in Singapore, which given the climate is quite a sartorially challenging place to be. Offices and homes are robustly temperature-controlled, but a foot out the door douses one in near-100% humidity and merciless sun. Of course nights and early mornings are far less punishing, even pleasant. Quite unlike the crisp heat of an English summer, though Hong Kong in August is arguably worse. I wonder what your opinion is on ancient madder paisley ties? In callower days I absolutely detested them, but recently I’ve found they appeal to me in a way they didn’t before. Thanks Simon – appreciate your reply! So you wouldn’t pair a grey tie with a grey suit? 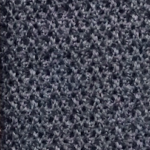 Im thinking along the lines of a dark grey basketweave or cashmere tie with a charcoal mini glen plaid fabric (holland and sherry 2016). I’ve just read your story with regards to mto-ties on the Drakes website. Interesting because I was thinking of ordering a mto-Drakes-tie myself. I was just wondering which length you chose for your tie. Regular Drakes ties or a hair too long on my body. I was wondering if ordering a tie 2 cm shorter would be enough or should i play safe and order one 4 cm shorter? I think 2 cm should do it but I did ask myself, when is a tie too short? Should the narrow end of the tie be just a little shorter then the broader end, in your opinion, or is this not important as lang as the narrow end is long enough to go through the loop on the broader end? Thank you so much for you insight. I went for 152cm, a 4cm increase on the normal 148cm, so it would be two centimetres longer than normal on the front and on the back blade. In terms of where a tie should sit, generally the front blade should finish on the trouser waistband, and the back blade should be the same length or even a touch longer (personally I think a touch longer looks more elegant than a touch shorter). Any tips on buying a first/last navy grenadine tie? What kind of grenadine would you go for (fina/grossa) and would you go for tipped/untipped? I’m thinking grossa is more casual than fina, but would like to hear your opinion. I was wondering where you’d reccomend for Vegan Ties in the UK? Especially thinking about the interlining, as lots of the cotton and linen ties still use a wool interlining. I have a reader comment of sorts. I’m wondering about ties. There are a few things I don’t get. I recently invested in some quality ties (Drakes, Canali) as well as having inherited some beautuiful old ties (Hermes, RL, some amazing old Tie Rack specials), and I wonder about a few things. First of all, woven vs printed. How do woven ties get colour (and colour differentiation like patterns?) How do printed silks get woven? Are both essentially woven and printed, but the weave on a printed tie can be much finer because the pattern is printed on, whereas with a woven tie the pattern comes from coloured threads being woven into a certain pattern? I struggle to understand this part. The same goes for cut on the bias. I have ties where the weave seemingly goes downward, but it was still cut on the bias. Is silk woven at an angle to get this effect? Another question I have is regarding the slip stitch. This is on the thinner, back blade, unless I am mistakes. You’ve written that pulling the slip stitch should bunch up a tie. I’ve tried that and it never does, no matter what the quality. Am I being a bit scared to break the tie or is it not as clear as that? Hi, a lot of questions! I have to say…you did a follow up to Boyer’s five tie column on Drakes…and if we look at all ten ties together…it is interesting that the colors are pretty much navy, grey and green. I don’t quite like navy on all greys. I think burgundy or browns or greens go better with grey. Do you think brown ties are okay if one is wearing black shoes with the grey/navy suit? I’ve noticed that with striped British ties, the stripes’ higher side is always on the right, and that with striped American ties the stripes flow in the other direction. British stripes are said to draw the eye up towards the man’s face, since we read from left to right, while American stripes would draw it downwards. Apparently US tie makers reversed the direction to distinguish their ties from those that were considered to be reserved for graduates of specific British universities. I do think that the “upward” British stripes look better, subtly conveying optimism. Of course, the direction of the stripes is a subtle difference, but people could notice it subconsciously. Do you think it’d be worthwhile for an American to seek out striped ties that flow in the British direction, to emphasize one’s face? Personally, no I don’t think so Tom. I don’t believe the flow from left to right makes any real difference. What are your thoughts on wearing a chocolate grenadine tie with a navy suit? The shirt would be a sky blue colour. I was wondering about ties that are (at least partly) cotton. I just bought a few that are part cotton part silk and I have to admit they don’t feel cotton apart from a more ‘madder’ touch. In terms of drape they’re just as good as silk and all they lack is some sheen. Do you think cotton is a decent tie material and do they lack any formality over silk ties when it’s not obvious they’re cotton? Some months ago I started wearing grey ties and the result it’s wonderful. I work in a bank on a client facing role, and grey ties match perfectly well blue suits. It is an option I would never have considered until PS appeared in my life some months ago. Do you think grenadine ties can go with navy mesh (h&s) blazers? In any case, any types of ties I should avoid with such a jacket? Thanks for the speedy response!! Do you think a plain grenadine would be too plain? The blue jacket with be worn with mid grey crispaire trousers. I was thinking of an light olive grenadine tie. Thoughts? Do you think a knitted tie could go with the above outfit? Or do you think that would be too casual. My gut is that it’s too casual. Any guidelines on tie width? Absolutely hate the trend for skinny ties. My lapels tend to be between 9 and 10cm. Do you think a 9cm wide tie is too wide? Whenever I see someone with a red tie, I now always refer to a politician. I just crossed paths on the escalator with a man wearing a navy suit and red tie. From a far I was wondering what he might do. As we crossed, it was Gordon Brown. What are your thoughts on the quality of HN White ties? Hi Stephan. I confess I haven’t tried one yet, but I intend to. It’s a white shirt with blue and yellow checks that makes it kinda vintagey. I’m wondering what kind/color of stripe tie you recommend to pair with navy/blue sportscoat? Hey Simon what’s your take on soft zig zag knot ties Vs stiff knit ones? Would one be more beneficial to certain outfits or material of sportscoats? Wonderful article and blog — it has been transformational for me and many others. Thank you. I am hoping you could clarify a point made several times in this thread, namely that care should be taken to ensure that the color shade of your tie is different from that of your shoes (particularly if wearing a brown tie/shoe). In short, if of the same shade, is it “wrong,” or merely an issue that the outfit could have been better by not having “too much of one thing?” If the later is true, why is the logic not commonly applied to one’s belt? Any thoughts on the above would be of great assistance to those, like me, who are in the process of building a wardrobe and choosing new wardrobe pieces a very deliberative process. Thank you. Hi Gerald – I’m so pleased you’ve found it useful. It’s not wrong, no, just perhaps a slightly less attractive combination. It doesn’t apply to belts because they are of the same material and texture of the shoes I think, though it’s a good point. Hey Simon how useful are black knit ties and can you wear them with anything other than black shoes even in a sportscoat ensemble? 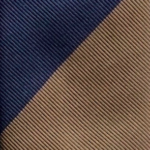 Just bought a navy grenadine tie online, and love the look. Issue is that it arrived with a pulled thread. Is this the sort of thing that commonly happens with grenadine anyway — i.e., do they end up having a shorter life than printed silk, or should I see this as more of a defect and ask for exchange? The way you tie your ties always looks great; with the coveted ‘not trying too hard’ look. 1) What are some neckties which would go well with a menswear uniform (navy sports coat, grey trouser, white/blue/white-blue stripe shirt) besides black knit? 2) What are some considerations I need to make in considering choice of neckwear with black shoes in the above outfit vs brown shoes. A big range of colours and patterns could go with this outfit – the key is to keep them fairly simple and the colours relatively cold. (See post here.) So red, green, yellow even brown could work. The red would just be a deep maroon, with some simple pattern (see here). Same goes for the other colours. And navy will always work. I rather like the ““nothing pleases me more than dressing simply but well” phrase. Of course there are other dressing strategies including the use of ties as weapons. I can only urge you, even if you choose not to publish this comment, to google John Bercow and imagine his capsule collection. The tie he wore to announce the blocking of the third brexit vote today might contravene a number of clauses in the Geneva convention. I’d like to ask you for your opinion. I want to buy a navy grenadine tie. I like striped shirts, with stripes narrow and relatively close to each other. 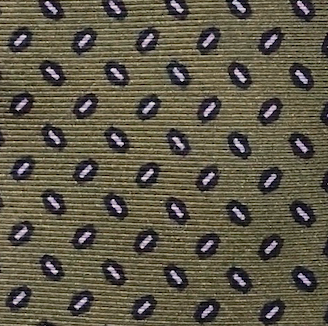 Do you think it is important to contrast the texture of a grenadine tie to the pattern on a shirt (i. e. to wear garza grossa with delicate, close stripes and garza fina with wide, somewhat spaced stripes)? I have to admit that I like graza fina more than grossa. I follow the general rule about not mixing patterns if they are of the same proportions but I think that with the texture of a plain tie there is no need for such concern. Please, what do you think?